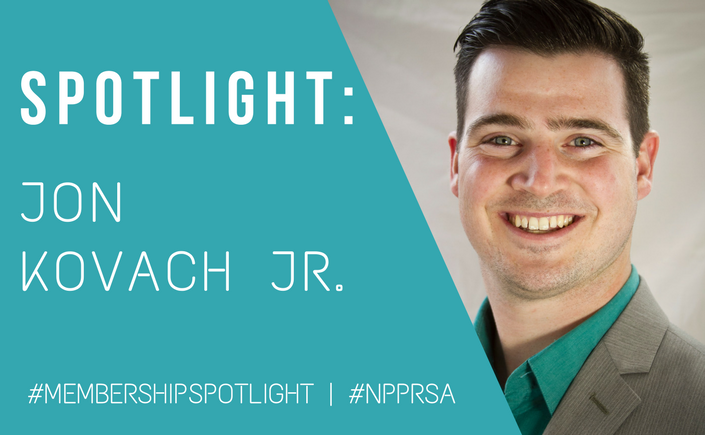 Member Spotlight: Jon Kovach Jr. While earning my associates degree in business at the LDS Business College in Salt Lake City, UT, a two-year trade school, I took a class entitled “Business Communications” where I learned the essential tools for strategic messaging. While in the class, we were challenged to send a letter of request to our supervisors and to generate feedback. Applying all that I had learned from class and from the text book, I crafted a message asking for a raise and generating a leadership position promotion for myself. I was granted the job and the raise upon my request. It was then I discovered my passion for business communication and it was both several instructors of mine who insisted I study public relations. During my undergrad, I completed 5 internships with several national and international brands including: Cotopaxi (an online, outdoor retailer), Coldwell Banker Commercial Advisors in Salt Lake City, and Spectrum Science Communications in Washington, D.C. The biggest challenge I’ve faced yet in my career has been taking the leap from one industry of comfort to another new and interesting industry. Though public relations and corporate communication can be virtually equivalent in it’s demands, the adjustments in creativity and strategy have really stretched me as a professional and has challenged me to learn more and more every day. The most valuable thing I’ve learned is quality-created relationships is vital to your success. You can pitch ideas all day. You can write up media alerts and construct strategies all day long. But without true, quality relationships brokered through trust, interest and respect, you cannot truly succeed. The best advice I have receive is to couple your learning between mentor and mentee relationships with the power of a mastermind group or accountability group. I’ve learned that mentors aren’t always going to be the Master Yoda’s in your life. Therefore, learning all that you can from mentor figures, researching their every move, and applying what you learned is only half the effort. You don’t just need a mentor in life. You need a mastermind group to hold you accountable to your goals and to achieve the success inspired to you by your mentors. In the past 12 months and because of the accountability in my mastermind group, I have written a book, pre-launched a podcast, started two businesses, and have climbed the ranks in my profession. Be curious. Ask lots of questions. Be willing to go out into the world and learn. Develop a habit of researching everything. Become a master Googler. Without natural curiosity and a hunger to learn, you will face the same mundane patterns in your life. Doing the same thing over and over again and expecting different results is the definition of insanity. In order to achieve things, you’ve never done before, you must take action in ways you’ve never done before. The greatest benefit of PRSA and the New Pros section is the MyPRSA Communities. I love pushing out questions to the general body of professionals in PR throughout the globe in MyPRSA. It is the closest thing to a virtual mastermind for PR pros. I use this discussion board so often because I always get feedback from different people and have wonderful, educated discoveries from those who have experience. If I knew everything then my career wouldn’t be fulfilling. No. Your career is something you need to strive to learn new things every day. I read about a book per week. With each new book and the many discoveries, I find new ways to increase my professionalism and develop stronger relationships. I’ve been an entrepreneur since I was 12 years old. It started with helping my mom with a vending machine business. Then I had a lawn care business at age 14. At age 16, I became a local DJ and Master of Ceremonies. Hundreds of events later, I have dabbled in international micro financing. Currently, I own a recreational tackle football league in Utah, a network marketing team through 3-Worx, and a private consulting business for professional development and strategic business planning. I also travel and do public speaking to various groups and organizations. So many things to learn and try so that I can be a better professional in PR and communication.